The government is actively considering amendments to the Telegraph Act and the Prevention of Money Laundering Act (PMLA) to provide legal backing for mobile numbers and bank accounts to be linked to Aadhaar on a voluntary basis. ET has learnt that the ministry of electronics & information technology has moved a proposal to this effect, which has gone through detailed legal scrutiny and is currently being examined by other stakeholder ministries, especially finance and telecom. 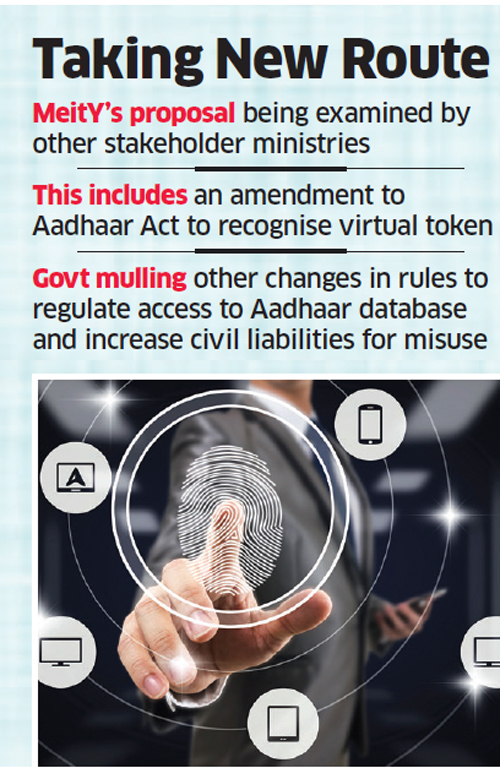 Further, those familiar with the details told ET that the proposal includes an amendment to the Aadhaar Act to recognise the virtual token that is used to prevent sharing of the actual Aadhaar number. The UIDAI has provided for this token through its rules, but stronger legal backing is now being sought. After several rounds of internal deliberations following the Supreme Court order on Aadhaar, sources said, it was felt that government should not look to bring back Section 57 and instead implement the order by introducing these amendments. The apex court had read down this provision, which allowed private entities to access Aadhaar database for verification purposes. However, the order left room for the government to legislate specifically for any services that it may want linked to Aadhaar. Here, sources said, the Telegraph Act provided the necessary space to bring in an amendment to include Aadhaar in the e-KYC (know your customer) options. The Act, it may be noted, already allows government to access or take over these services during a public emergency, added sources. Similarly, the amendment to PMLA will include the option for individuals to link their bank accounts to Aadhaar in the KYC options provided to the customer. This again would be voluntary and the customer will have the option to use other documents. PMLA already requires the government to be able to track the sources of funds in case of laundering related to terror actions, which is the basis to carrying out a periodic KYC exercise. Linking bank accounts to Aadhaar, sources said, enables the government to execute any task, if required, and amendment to this end will provide the necessary legal cushion. Besides this, the government is considering a range of other changes in rules to regulate access to Aadhaar database and increase civil liabilities for misuse. As for issues related to privacy, mentioned by the Supreme Court, the government is moving on Data Protection Bill submitted by Justice Srikrishna Commission. Many of the privacy concerns, sources said, are likely to be addressed in this Bill.